In my last post, I introduced you to six contemporary cloth diapering systems. Today, I’ll share reviews of the brands and systems I’ve used, and give you the scoop on one of the most important topics in the world of cloth diapering — money! Cloth diapering requires you to spend a good chunk of money upfront to build up your “diaper stash” before your newborn arrives. Next to doing extra laundry (more on that later), that’s probably the biggest con associated with using cloth rather than disposables. 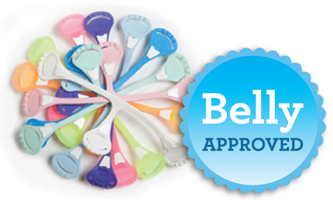 However, you can always take advantage of the fact that you can add cloth diaper supplies to your baby registry. 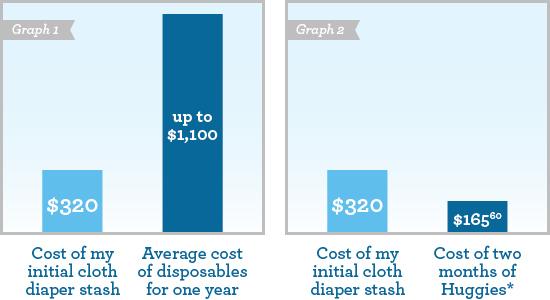 Although it’s not cheap at first, when you divide the cost over two to three years of cloth diapering (and consider reuse for subsequent children), it can be very cost effective. Cloth diapers actually hold their value for resale, too. On average, a minimum of six to eight cloth diapers are needed for daily diapering, assuming you do laundry once or twice a day. I did two or three washes a day in the first month with my newborn son because I only wanted to buy four newborn-size diapers (I knew he would outgrow them fast). Now that he’s about two and a half months old, I have seven diapers in rotation, and it’s perfect. I do a load of laundry in the evening and hang the diapers to dry overnight so they’re ready the next morning. What I like: These are soo soft! The material used for these diapers is really lovely, but it’s also strong enough to contain even the most explosive poops! They wash great, and I can reuse the shell and replace the insert area for pee diapers. These are my choice for when we’re out and about running errands or on day trips because they’re quick and efficient. What I don’t like: There are no cool colors or prints (just a creamy white), but that makes them good for both genders. I also noticed that the sizing ran a bit small in the beginning. The newborn size was too small for my baby from the start even though he weighed 7 pounds, 12 ounces, and was 22 inches long (which is average). If I had known this, I might not have spent money on the newborn setup. Now he fits perfectly into the Midi size, which is consistent with his height and weight. Nighttime Use: Don’t count on this diaper to last for more than about four hours. I usually nurse and change my son three times at night, and I had to use two inserts in this diaper plus an extra fleece liner (just a scrap of fleece fabric cut to fit) to keep his skin dry. Now I only use this setup for the latter two-to-three hour stretch of the night. What I like: There are lots of cute colors to choose from, and they fit exactly like they said they would — the x-small fit my son until he was closing in on two months old! The leg gussets are great for containing potential blowouts, and they can be reused. What I don’t like: The Aplix fastener tabs started to get a little weak towards the end. I had read about this in some reviews, and it’s true. It never got so bad that the diaper came undone though, nor did I worry it would. I did not test these covers for nighttime use. What I like: Blueberry has one of the best selections of cute prints and colors, and the reusable covers have leg gussets (similar to the Thirsties brand), which I believe are crucial. The hook-and-loop tabs are very strong, and the snaps that allow for adjustable sizing are holding on too. I had read some reviews that the snaps can become easily undone while diapering, but that has not happened to me. The claim that one size fits from 10 to 40 pounds seems accurate so far (although it was a little big for my son when I switched him to this cover at 12 pounds). What I don’t like: The material is not as soft as Thirsties or Mabu Baby, but I would still classify it as a soft fabric. Overall, I don’t have many complaints about this diaper cover. Nighttime Use: These covers hold everything in and stay dry on the outside as long as I use them with a cloth prefold, a Mabu Baby liner and a homemade fleece liner. My son has his longest stretch of sleep in the first part of the night (normally about five hours), and this setup worked well for that amount of time; however, I don’t use it as often because it involves more steps and maneuvering, which I worried could jeopardize his sleepy state. What I like: They are small and cheap. They shrunk up after I pre-washed them, so they were perfect for newborn size and still worked well at 9 weeks. They aren’t too bulky in the middle, but that means they don’t absorb as much. I got creative and put the Mabu Baby washable insert down the middle as an extra liner. What I don’t like: They shrunk as all prefolds do, but these were pretty small. I will not be able to diaper my son in these for more than another month or two, but I plan to keep them for doubling up in other cloth-diaper systems as well as for burp cloths and wash rags. As I stated previously, these provide little to no absorbency and required an extra liner to keep my little one’s bum dry. What I like: I love Snappis! They come in a variety of fun colors, and they never come undone when used on the correct fabric. What I don’t like: They’re easy to lose, and I wish they gripped all fabrics. According to BabyCenter’s Baby Cost Calculator, disposable diapers cost an average of $72 a month for the first year, and disposable wipes add on an extra $20 a month, totaling more than $1,100. Bargain websites provide tips for cutting the cost down to between $500 and $900 a year, but that still doesn’t come close to the $320 I spent up front on cloth diapers! (See Graph 1.) Even if I buy some more cute prints or experiment with different prefolds, I can say with confidence that the total I will spend on cloth diapering in the next two years will most likely never exceed $500. *Cost based on buying 360 Huggies Newborn Snugglers at $0.26 per diaper and 360 Huggies Snugglers (Size 1) at $0.20 per diaper. It has been argued that extra laundering adds to the overall yearly cost of cloth diapering, with water and electric bills as well as the cost of detergent. As I mentioned previously, I usually just do one load of special diaper laundry per day and let it air-dry overnight. The detergent I use (Ecos Free & Clear) is not expensive, and I only use about a tablespoon or two for each wash, so it lasts a long time. Front-loading, energy-efficient washing machines can help you use less water and electricity too. Overall, I don’t consider laundry costs being worth reporting. That would be like adding in the cost of trash bags and garbage disposal when calculating the cost for disposable diapers. What I like: Well, the print of course! I decided to go with all snaps instead of Aplix/Velcro this time, and I Iike it! This diaper fits well, and the inside fabric that touches my little one’s skin is soft as well as absorbent. It’s easy to stuff the pocket area and also easy to wash. This is my hubby’s favorite cloth diaper! What I don’t like: I was disappointed to find no inner leg gussets; however, this diaper has not failed me yet. The inside is pure white and stains easily, so I get upset when it gets soiled. It’s also by far the most bulky of the setups I have, and you can only use it one time before it goes in the hamper. Nighttime Use: Night diapering was the main reason why I bought a pocket diaper. I feel confident putting this soft, comfortable diaper on my son for his long stretch of 5+ hours at night. It’s consistently held up well for that long, and I have a feeling it would make it through a full night. These diapers are just as quick and easy to pull off and put on as disposables, so I plan on buying two more to add to our nighttime routine. Despite the relatively short time I have been cloth diapering, I can truly say that I love it. I am thankful that so many other parents who use cloth diapers put their time and effort into great reviews, blogs and video tutorials to get me started. I would not be writing up my own cloth diapering experience if it were not for all of them. Hopefully I have given you some good insight into this money-saving and eco-friendly solution. It is well worth it! I love it too! I would never go back to disposible diapers. The blueberry diaper covers have the cutest patterns out of all of the brands, in my opinion. Love your blog!